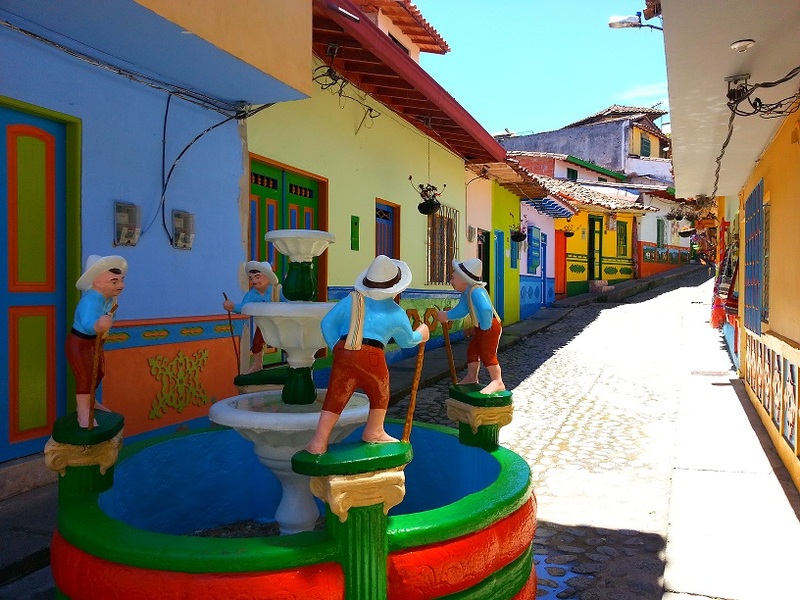 On the street in Guatape old town… see what I mean about the colours!! Today was one of my favourite days on the bike trip so far… and not (only) because the total distance travelled was 80kms!!! 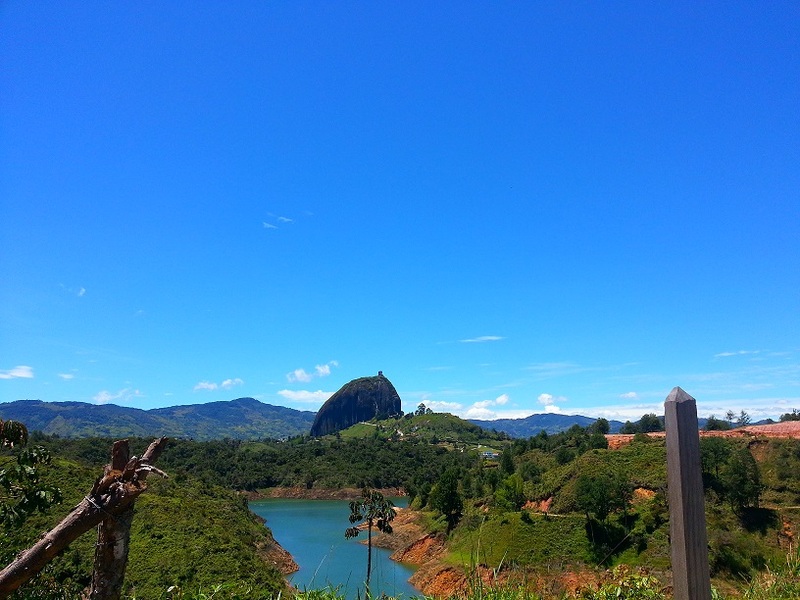 We started with a short ride to ‘the rock’ (actually called ‘the Peñol’) in Guatape, which we’d heard about from the Kiwis. It’s basically a massive granite rock in the middle of a valley/lakes region with an amazing view… once you climb the 700 stairs/ 220m to the top! It was excellent… and really beautiful. Then we went into the Guatape town centre, which was equally great. Every building was painted in fantastically bright colours, making the whole town just seem so happy. It was on the water, had a cute little town square, it was sunny but not too hot and just really lovely. We hadn’t decided whether or not to stop overnight in Medellin, which is Colombia’s second largest city after Bogota and has a population of about 2.7 million (in the greater Medellin area). According to Wikipedia, in early 2013 Medellín was chosen as the most innovative city in the world due to its recent advances in politics, education, and social development… so a stop there was definitely an option, and we decided to find somewhere for lunch and then decide whether or not to keep going. Adrian navigated us to a very cool part of town near one of the universities and with heaps of cafes and restaurants etc… and we decided to stay. Not before, however, I had confirmed first hand what I’d heard from others: Colombians are some of the friendliest people you will meet, anywhere. 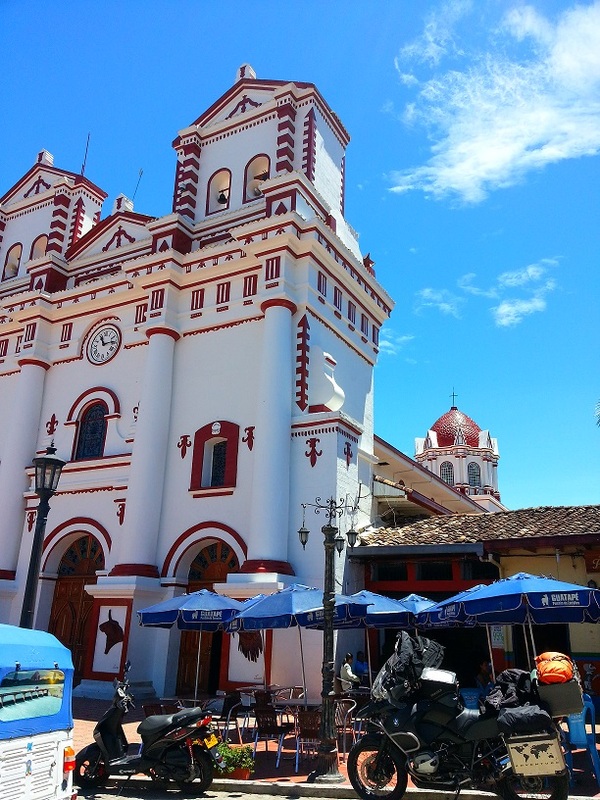 Already, I was building to this conclusion – what with Arturo yesterday guiding us along the road towards Medellin and buying our lunch, plus Adrian was approached by a pilot in the Columbian airforce for a chat while sitting in the square in Guatape. And then we got to Medellin… There are lots of one way streets in this part of town, and so we had stopped by the side of the road about two blocks from the hostel we were aiming for (Casa Kiwi – it had to be good, right?!) while we figured out how to actually get there. A very well dressed man approached us and asked, in excellent English, what we were looking for and if he could help. He started to explain the way to the hostel, and then his (I think) wife, also looking very stylish, came out of one of the shops… and they both got into their car to guide us right there! And then, once we were at the hostel, he jumped out of the car to give us his name (Juan) and phone numbers and told us to call him if the hostel didn’t have secure parking, as he lived only two blocks away and we could park the bike in his garage. How nice is that?!! People are just so friendly and polite all the time, and for no reason other than they’re just friendly; it’s the norm here. I like it! As it turned out, the hostel did have parking… and there was another BMW in the garage which belonged to a guy from the US who was a couple weeks shy of finishing a five year journey doing what we’re doing. Five years?! Wow – good on him; that would be too long for me. There was also a touring bicycle in the garage which belonged to a Scotsman who is riding from Mexico down to Buenos Aires. So – lots of interesting people in a very funky little part of town that reminds me a bit of Paddington in Sydney. The only downer on an otherwise excellent day was that Adrian is coming down with some sort of cold/tonsillitis thing… it started in the afternoon and I’m hoping that he’ll be fine by tomorrow morning. This is ‘the rock’ from a distance – yes, we climbed to the top! 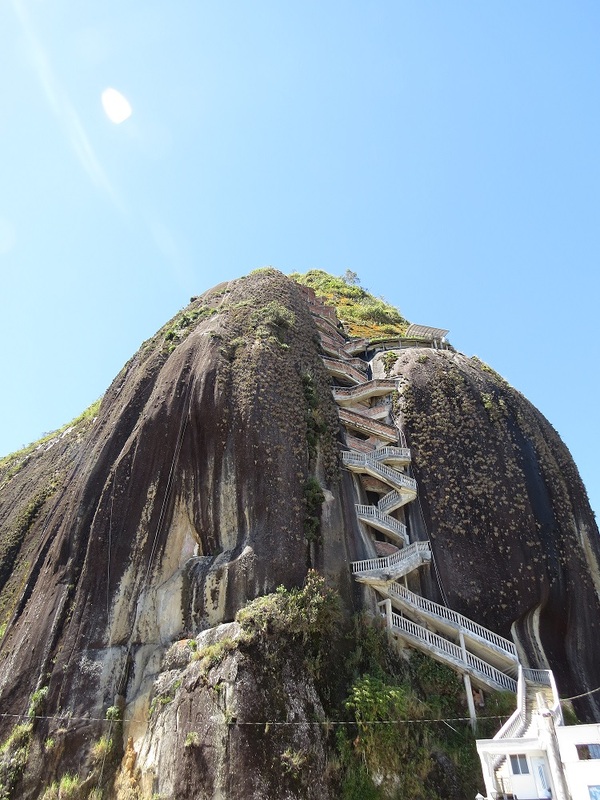 These are the stairs built into the side of the rock… they look very dodgy but seemed solid! !